The first project started, a number of years ago, when the 100 psi compressed air system needed replacing due to the advanced age of the air compressors. The previous units were 100 hp fixed speed units operating in a combination of modulation and load unload mode. The system used standard compressed air filters and non-cycling air dryers. During normal operation, the plant pressure ranged from a high of 107 psi to as low as 78 psi due to pressure differentials in the system. The plant had already implemented some improvements to their system in eliminating compressed air drying on their filling lines, and by turning off the main compressors on weekends (a small reciprocating compressor was used). Plant personnel were interested in renewing the compressed air system to make it more efficient, and had heard of the power utility incentives offered, so they requested some energy analysis. Figure 1: The as found system was found to be operating inefficiently, note how the air compressor amps fall from 70 to almost nothing when the reciprocating compressor runs. Click here to enlarge. Data loggers were placed on the 100 psi system, which showed the compressed air system was running inefficiently due to the type of air compressor control and the lack of enough storage receiver capacity. The system also had some significant pressure differentials across the piping, air dryer, and filtration system. Leakage was estimated at 27 percent of the average flow and the timer style condensate drains were contributing to wasted flow. Estimated energy consumption was pegged at 746,000 kWh per year, about 11 percent of the total facility electrical costs. The utility predicted that if a VSD compressor was installed, along with other improvements, an operating cost saving of 35 percent could be gained. Further to this, some preliminary assessment of the 600 psi PET bottle blowing system was done. This system used a 600 hp multi-stage water-cooled reciprocating compressor to supply the system that produced plastic beverage bottles, first passing the air through a refrigerated air dryer. This system was identified as an item that contributed significantly to the plant energy costs, mainly through peak demand charges. No work was done initially, but further testing a few years later found that this system, and an associated evaporative cooling system consumed 1,425,000 kWh and contributed to a peak facility electrical demand of 425 kVa. Figure 2: The 600 hp 600 psi PET air compressor consumed significant power. A heat recovery ventilation system saves natural gas costs in winter. Figure 4: VSD air compressor control increases system efficiency. For the PET system some data logging of pressure, flow and power showed the existing air compressor was very much oversized for the load. After a few years, excessive repair costs convinced plant personnel to do something about the system. Because the compressor was so big, the compressor cooling system was also oversized, and consumed significant extra power due to the way the circulation pumps were controlled by throttling. The power utility and PepsiCo Corporate engineering also looked into the possibility of recovering high pressure compressed air from the bottle forming machine for use as low pressure air. The bottle blowing machine maker (Sidel Inc.) had a high-pressure compressed air recovery system retrofit for the existing bottle blower (more information on high pressure recovery in this article). Basically, some of the 500 to 600 psi air used to form a beverage bottle can be captured at around 100 psi to be used in the internal pneumatic circuitry of the bottle-blowing machine and with the excess fed to the main 100 psi system to reduce the power for the low pressure compressor. Figure 5: Installing a smaller oil-free rotary screw air compressor, with a heat-of-compression dryer, saved energy in the PET system. Figure 6: The new PET system greatly reduces demand and energy on the electrical bill. The power utility verified both projects at the end of the commissioning. Overall the combined savings were 806,000 kWh per year and estimated natural gas consumption of 9,700 m3. The 100 psi system saved 35 percent in operating costs over the base case energy consumption, very close to the level predicted by the utility. The PET project saved 38 percent in electrical operating costs and significant annual repair costs. 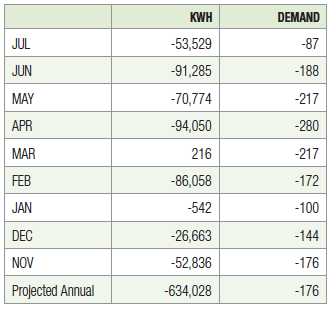 The PET project savings had such a significant impact on the facility demand charges that the reduction in demand was very obvious, something not all that common for energy projects. Figure 6 show the results, during months where year-over-year monthly energy was not reduced due to the level of production, the plant peak demand was still lower due to the smaller PET compressor size. This project shows the value of utility energy programs and the measuring of the compressed air baseline. In this case, the utility had excellent compressed air technical support and was able to perform some free compressed air assessments to analyze how the systems were working. The utility stayed with the project after the assessment and supported the PepsiCo plant Operation and Engineering in helping calculate the savings for various different compressor options and other energy measures. The utility then came to the table in offering significant energy incentives, in this case more than $159,000, to help pay for the additional costs to purchase extra energy saving equipment. The projects are generating savings of over $60,000 per year in energy costs alone. To read more about Food Industries please visit, www.airbestpractices.com/industries/food.